Looks and tastes more like spinach. Slower to bolt than spinach, Perpetual is a great choice for Southern gardens. 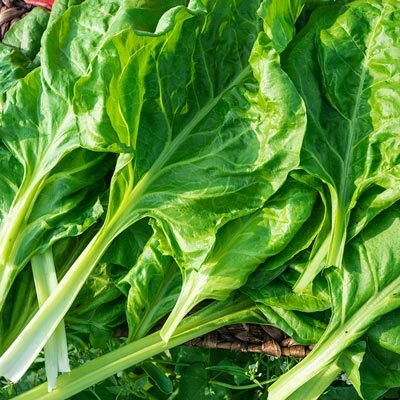 Its smooth, dark green leaves are flavorful and rich in antioxidants. Because it is slow to bolt, it extends the harvest season. Approx. 200 seeds per pkt. 50 DAYS. For each offer ordered, get 200 seeds per pkt. Spacing: 12 - 15 inches between plants and spaced 24 - 30 inches between rows. Foliage: Smooth, dark green leaves look similar to spinach leaves-and taste similar to spinach. Slender, light green stalks. Soil Requirements: Well-drained, fertile soil; pH 6.0 - 6.8. Pruning: Remove leaves as desired and enjoy yields all summer.